I was very surprised to read that this new 70000 ton carrier will not carry a full load of 40 F35B fighters - but just 12. 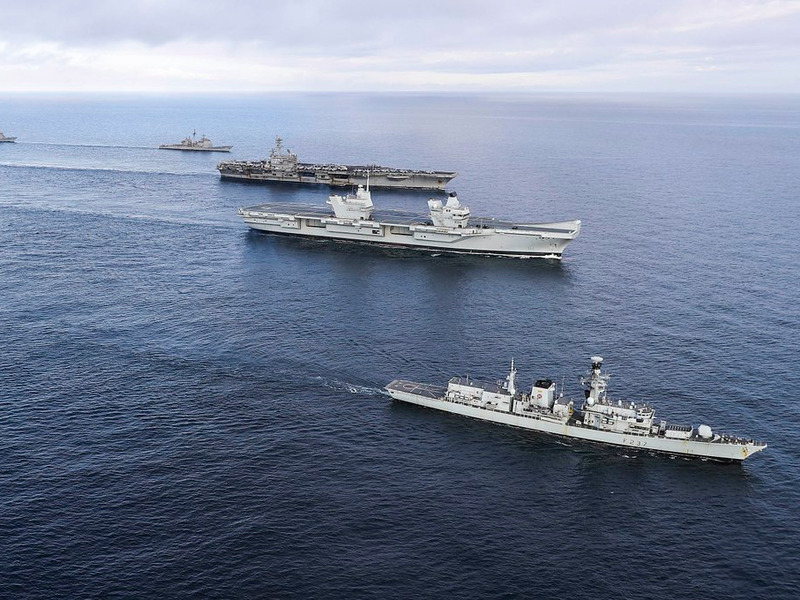 Very big ship for just 12 aircraft, and the Royal Navy is getting two of them. Bad state of affairs for the RN. And they will be sailing around for about 3-5 years before the aircraft are embarked due to the lateness of the F-35B program. Hi Craig, I’ve read similar, including only one carrier will be operational at a time, the other in reserve, i.e. when the second is finished, they will test it and make sure everything works, then lay it up for a while. In regards to the planes, well they started with the VSTOL version, and then changed to the U.S. carrier version, but because of costs to change the carriers to a catapult setup was so expensive, they reverted back to the original VSTOL skijump config and will not have any arresting gear, thus their air wings will be limited to Merlins, Osprey's, Chinooks and VSTOL F-35’s. 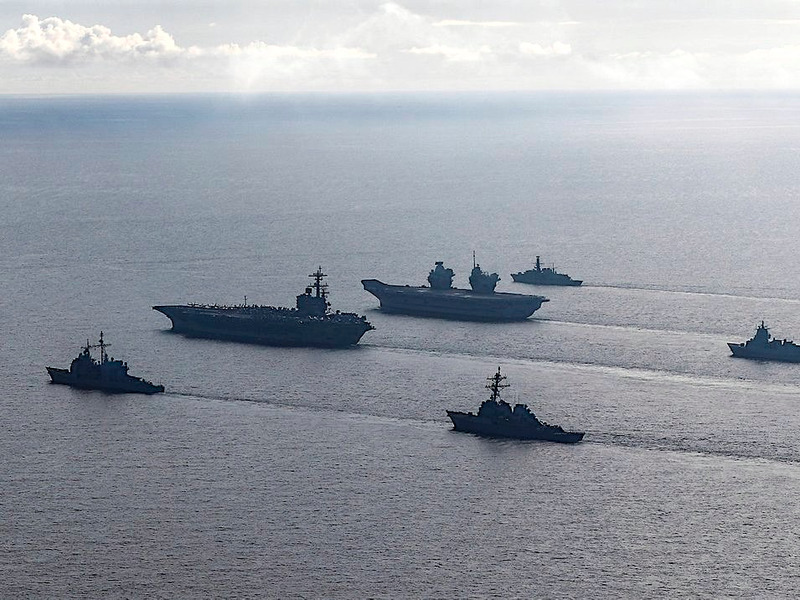 That means they will cross deck with the U.S Marines, Italian or Spanish Navies, as they will have the same short range support airwings of a Wasp, Cavour or Juan Carlos, Whilst the U.S. Navy and French Navy operate long range attack airwings that also have hawkeyes, long range refuelling aircraft and electronic jammers such as the F-18E. So yes, they are very big ships for the roles they will perform (more than twice the tonnage of Cavour and bigger than Charles De Gaulle). HMS Queen Elizabeth leaves her Birthplace, Rosyth Dockyard, to commence Seatrials today. She is leaving the Basin at high-tide, but then must wait in the river for low tide in order to get under the three Bridges across the Forth. Even then, her pole-mast must be lowered to allow her to do so. She will embark on 5 weeks of trials, followed by her first entry to her new homeport of Portsmouth where she will stay for a week. This will be followed by another 5 weeks of trials. I was watching it on the news this morning on line. She took nearly 3 hours to get out of the basin as she only had 14 inches on either side of the lock to get out so was taken very slowly and it had to be at high tide as even then she only had 18 inches under her keel. She was passing under the bridges at midnight which was at the lowest tide. If you stood on the highest part of the mast (that hadn't been lowered to fit) you could apparently touch the bottom of the railway bridge. Wonder if they had to curtail her size a little to make sure she could get out. I'd say it must have been a factor in her design. Looks like she hasn't had her CIWS's fitted as yet either. I gather that will come after trials and will be done in Portsmouth during her PSA. RussF172 wrote: I was watching it on the news this morning on line. She took nearly 3 hours to get out of the basin as she only had 14 inches on either side of the lock to get out so was taken very slowly and it had to be at high tide as even then she only had 18 inches under her keel. She was passing under the bridges at midnight which was at the lowest tide. If you stood on the highest part of the mast (that hadn't been lowered to fit) you could apparently touch the bottom of the railway bridge. Wonder if they had to curtail her size a little to make sure she could get out. I'd say it must have been a factor in her design. Interesting thought Russ, it wouldn't be the first time a ships design was limited by another factor. The Iowa class battleships beam was limited by the Navy's requirement that they be able to use the Panama canal, only a foot either side basically. Once in the Firth of Forth, anchored up, wait for low tide, then off she goes. Magnificent ships! The RN can build them pretty. Yes, anyone in TF72 getting ready to build one? Awesome video Robert, the aerial view with a few 'Bods' on the Flight-Deck helps show what a huge bit of kit she is. I personally didn't originally like the two island design cosmetically, but it is growing on me. Somebody will surely pick up the Gauntlet and build one. She was designed a while ago and in the last few years they discovered the majority of flight decks were not strong enough, or capable of taking the heat to support the F35's. Every ship except the USS Tripoli (still under construction) has had to go/or is going into the yard to be modified over time. Does QE have to go back and have the same work done later, or did they have time to add in the extra requirements in initial construction? She is about the same width as a Nimitz Michael, so yes, a big Bugger. I am not sure about the Flight-deck Robert, but I would say the decision to go STOVL over CTOL was taken early enough to have all bases covered. Incidentally, a Chap from the UK (who was from BAE Roysth working on her) who worked for me for a while here, said that provision was made for, and retained for Waist and Bow Catapults in the form of the troughs below Flight-Deck level, should the decision be reversed. There are also heaps of redundant compartments, bare, awaiting any future upgrades. I saw something similar aboard the Ocean-Survey vessel HMS Scott when she was new, heaps of empty compartments, nicely painted, a few pipes and cable -runs passing through at Deck-Head height, and was told the same, plenty of room for growth. Can't wait for the next phase in the introduction of these magnificent ships. Hopefully they see the light and add in the catapults or arresting gear at least and switch to the F35C. Then the air-wing will actually match the ship and QE will be inter-operable with US carriers and CDG. If they stick with the B version, which is the heaviest of all 3 variants, it has less range and less weapons, and that counts for a lot when it comes down to the reason behind having the ship in the first place. The B was pitched at the Cavour, Juan Carlos and Wasp class, ships that are between 30 and 50 percent less tonnage. I remember seeing a doco on the USS Ronald Reagan, and the point would apply here given the expected 50 year life span of the ship. The last capt of QE has probably not even been born yet. That is certainly a sobering thought Robert. That Captain will be born, grow-up, probably join the RN in 17,18,19 years time or so. Gulp, I suddenly feel a little, shall we say Mature (my Wife would contest that notion ) . USS Enterprise CVN-65 had a 51 year life span. A couple more Pics. The one with the Merlin on deck truly shows the width of the Flight-Deck, and they are BIG Helicopters. All Ships boats are stowed in, and launched from bays within the Sponsons. That bow shot is great as you can see the base plates for the Phalanx's to be fitted on either side. They will probably go on in Portsmouth after her trials. This would be a great project if you could get plans. I seen this article in the news paper. An amateur drone pilot landed his $500 dollar drone on the New QE carrier unchallenged. He was just wanting to get some footage when berthed in Scotland. With patrol craft in the water and security forces dockside as well as on board crew members. Not one person noticed that a drone was flying around as the pilot did not see any activity of security forces swinging in to action to combat the drone to find the operator. The pilot then had an alarm from his transmitter of a technical fault indicating for him to land the drone ASAP well the flight deck was not far off so he landed it on deck not intending to stay long possible to sort out problem then lift off again. It was only then that it was noticed that no aircraft of any form were authorized to be on deck. A full investigation in to the security breach has been launched. I don't know how true or accurate the info is just what i read. Given all the bad press that's followed HMS QE like a bad smell, here's some good stuff. 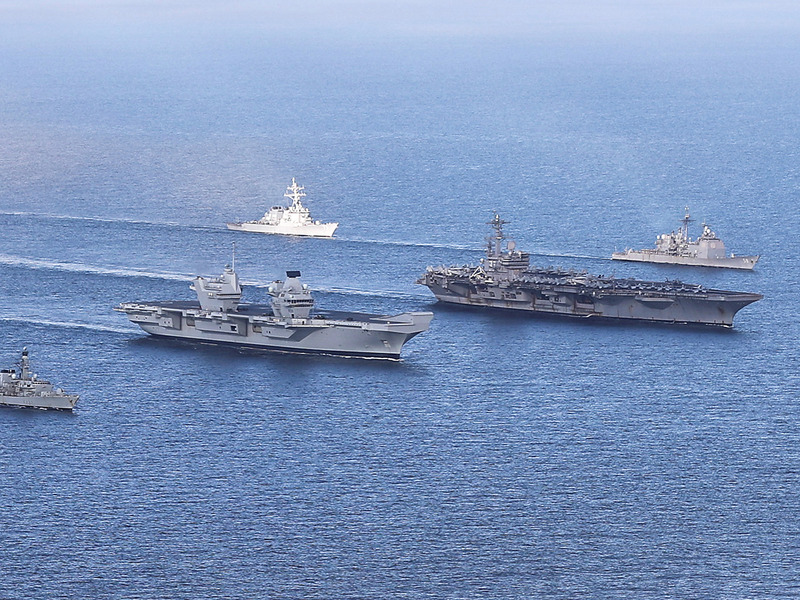 Queen Elizabeth rendezvoused with USS George H W Bush several days ago, leading to these shots.